After a year of teetering on the edge, a cliffside apartment building at 310 Esplanade in Pacifica on Monday was demolished. Demolition was over in a matter of hours, but a complete cleanup process could take a few days to wrap up. During the demolition, project managers used drones to monitor the beach below for falling debris. 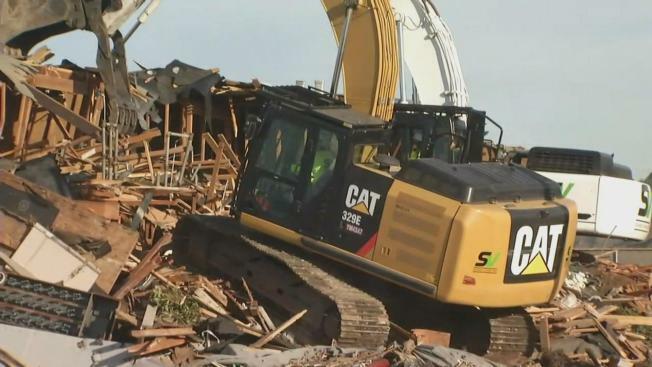 "We usually have a lot of space, but we spent weeks studying the structural drawings and planning out our method of removal," said Scott Helf, senior project manager with Sillicon Valley Demolition. On Tuesday, workers will be lowered to the beach to clean up any fallen debris, Helf said. The Pacifica City Council in early January agreed to pay a demolition team nearly $219,000 to knock down the building because of a public health and safety threat. The final demolition bill, which the city currently is on the hook for, turned out to roll past the $300,000 mark. City officials claim the owner of the building is being negligent when it comes to paying for the demolition. City leaders were eventually forced to step in and commence the demolition because of the safety hazards, but they are hopeful that the owner will reimburse the city. "We contacted (the owner) through our attorneys to get him to actually take this action," Pacifica City Manager Lorie Tinfow said. "It's really his responsibility, but he was not in a position to do so, and essentially time ran out." The building, which was built in the 1960s, contained hazardous materials that city officials claimed would present a significant threat to public health if there was another major storm, earthquake or other destabilizing event that could cause portions of the infrastructure to crumble. Crews spent the past two weeks removing those materials before the building was torn down. The city is in the process of applying for state and federal aid to shore up the cliff below. "We will do everything we can to protect the street because the street and the infrastructure is the responsibility of the city," Public Works Director Van Ocampo said. On Jan. 25, 2016, the city of Pacifica said the apartments were uninhabitable due to coastal erosion. Pacifica Chief Building Official Mike Cully "yellow-tagged" the apartments and several homes, meaning residents were allowed to access buildings only to remove their belongings. Monday's demolition marks the third time in one year that a coastal apartment building in Pacifica was dismantled.